After having my lunch (my favorite vegetarian beehoon) at home and taking a bath, I brought Reever to temple. He was having Buddhist class today at Kwong Meng San from 2 to 3.45pm. 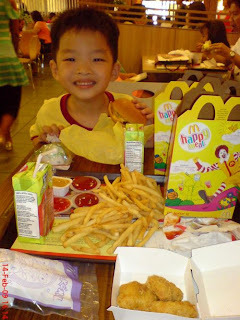 After the class, we had our lunch at McDonalds in Ang Mo Kio. I bought two set of happy meals, one for him and one for me. Reever was aiming at the toys (pokemon toys). He was very happy with the meal. We went back home then I found out that I forgot to bring the house key, while nobody was at home. Lucky Raymond has just finished working and on the way back home. 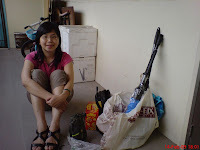 I asked him to reach home faster as I wanted to pass motion.. kekeke.. so he took a cab and reached home in about 15mins ba... *Picture: me waiting outside the home door. I went to toilet and took a bath. When I went out from toilet, Raymond has set up his gifts on the dressing table. 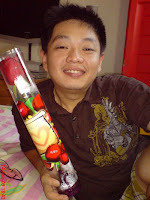 He bought me a stalk of rose, the oil w/ blue rose - for nice smell, a small decor consist of 6 roses, and a blue present box filled w/ one Doraemon handphone strap and one Doraemon key chain (can put photos inside). Thank you Laogong!!! We took pic after that.. and got ready for dinner. We took taxi to Buangkok MRT and had our dinner there. We waited for more than an hour until the food came. Not bad lah.. We ordered 10 dishes (including chilli crab), and ate until very full.. Just came back home and will sleep after this. Hope all of you had a great day too today... Ciao!!! Yes... Happy Valentine's Day everyone!!! Hope you have a great time today!!! Got flowers? Chocolates? Or nothing?? NO worries!!! You've got ur love, that's the most important!!! Not just love from ur partner.. but also from ur families.. Your parents, siblings, friends, and many more. I read 'mypaper' few days ago saying that in South Korea, survey said that most women are expecting to get travel voucher as their Valentine's gift, while chocolate and flowers are the lists behind it, while the men are expecting to get cash as now they're facing economic crisis there. When I read it.. just wondering in my mind.. where are all the romances that used to be there during the V-day? Has it all been replaced w/ all practical things such as travel voucher and money??? But of course, I won't reject and would be very glad if someone handed me that travel voucher in front of me! And I'm sure guys won't reject too if the girl handed in lots of cash in front of him.. hahahahahaha.... Haiya.... what a world!!!! So, how are you going to celebrate the V-day tonight? I've dinner appointment w/ my husband's families. We're going to eat cu chao at Buangkok MRT there.. Tried once before and it was not bad.. Quite nice the taste of the food. My mother-in-law and sis-in-law won 4D for the second time and they won quite a lot this Wednesday, that's why we're going to celebrate. Well.. going to have my lunch now.. Again.. have a great day everyone!!! Aniwae.. don't care so much la.. I like to make friends, but no enemy. If you think I'm your enemy, then too bad lor... I'll still treat u as someone.. but w/ limited gestures, of course.. so that you understand what it feels like..
Just called my bro and found out a very good news!!! 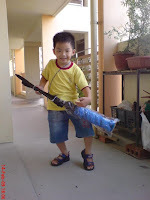 My brother's son, my cousin, managed to enter RI for his Secondary level education! Well done!!! And my bro will start working next Monday, getting the job that he long wanted! Good luck for both of you. Two days ago I also received great news from my sis in Melb.. They had the ultrasound check and found out that the newborn baby is baby boy!!! Congratulation once again!! And take care of your health ya.. you still have another half way to go!! Thank God that He heard our prays.. Hopefully other wishes would come true too..